The following is a guest post by Daniel Garst, a Beijing-based American writer. This article originally appeared in the March 24, 2011 China Daily Metro edition. Nothing concentrates the mind of economic planners quite like political instability in key overseas energy suppliers. China’s new Five Year Plan therefore not only mandates further reductions in the energy used in generating economic output, but also sets, for the first time, overall consumption goals. Making buildings here more energy efficient will be one key element in achieving these goals. A January 7, 2011 National Geographic News story states that the building sector absorbs 30% of China’s energy, a threefold increase since 1980. Beijing has recently made notable progress in reducing energy waste in this area. A thirty percent wholesale subsidy program encourages the purchase of efficient light bulbs, while local authorities have aggressively pushed a coal-to-electricity project in hutong neighborhoods. This program both lowers sulfur emissions and energy use, as the electric heaters are more efficient and have adjustable thermostats; some models even have thermostats pre-programmed to use less electricity during peak day hours and store it up at night. Rooftop solar water heaters are also now a common sight in Beijing’s hutongs. Moreover, a Ministry of Construction crackdown has raised the compliance rate with the construction code calling for new Beijing buildings to use 65% less energy than their 1980s predecessors to over 90%. However, even with this success, Li Bingren, chief economist at the Ministry of Housing and Urban-Rural Development, notes in a September 21, 2010 China Daily story that heating energy consumption in buildings here will still substantially exceed those in the west. Fortunately, lots of room still exists for further efficiency gains. For example, heat for most residential buildings is still supplied by coal-fired boilers pumping hot water into radiators, so dwellers cannot lower or turn off the heat when it warms up or they’re out of the house. An October 2010 University of Nottingham China Policy Institute paper on energy consumption in Chinese buildings states that 7% of the heat here is wasted when people open their windows because they have no way of controlling it themselves. As incomes continue rising in the capital, Beijingers will demand larger flats with more lighting and electrical gadgets. This makes it imperative for new buildings to allow residents—China’s 2008 Energy Conservation Law mandates that they be charged according to the amount of heat used—to control interior temperatures. Subsidies could also be given to residents adopting thermal technology products that automatically allocate heat to rooms with different temperature demands. Lastly, Beijing can be much more aggressive in retrofitting not just siheyuans, but other residential units as well. The National Geographic News article cited earlier notes that Harbin has spent 1.1 million RMB to improve wall insulation and roofing in 2 million square meters of residential buildings. Many high-rise commercial buildings also waste energy. The University of Nottingham paper notes that while such structures take up just 4% of the floor space of Chinese construction, they account for 22% of the building sector’s energy use, thanks to poor design, especially badly insulated windows. But the newly completed Parkview Green building on the Dongdaqiao Lu, which sports a slanting environmental shield resembling a giant greenhouse, shows that such structures can be very green. In 2010, it was the first Chinese building to win the prestigious MIPIM Asia “Green Building” award. And just down the Guanghua Lu stands the Prosper Center, Beijing’s first LEED Gold certified building awarded by the U.S. Green Building Council. 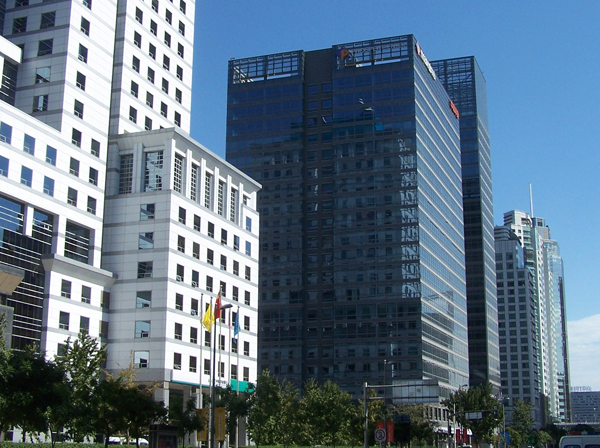 While both these buildings were expensive build and are costly to lease, Beijing’s first U.S. Natural Resources Defense Council certified green building, the Science Ministry headquarters, demonstrates that green construction can be less expensive in the short- as well long-run. According to the Christian Science Monitor article on this structure, by avoiding the use of expensive materials, like marble, it cost $700 per square meter to build vs. the $850-1000 per square meter for other government buildings. Of course Beijing’s construction industry still lacks a green material supply chain and expertise. However, these things will develop as more of these buildings are constructed. And since most factories have already been moved from the capital, Beijing will have to go green in building to do its part in helping China conserve energy.